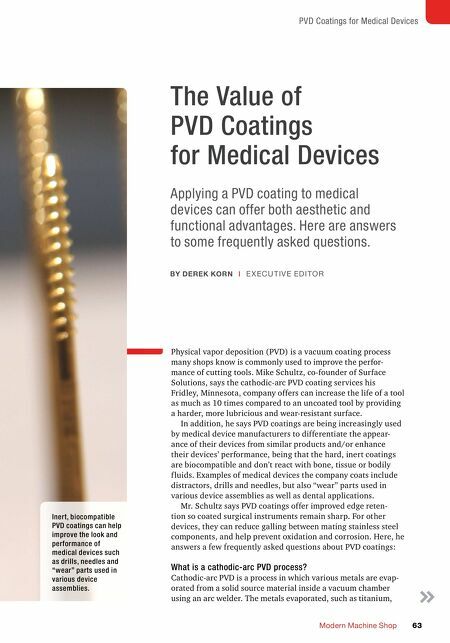 PVD Coatings for Medical Devices Modern Machine Shop 63 The Value of PVD Coatings for Medical Devices Applying a PVD coating to medical devices can offer both aesthetic and functional advantages. Here are answers to some frequently asked questions. Physical vapor deposition (PVD) is a vacuum coating process many shops know is commonly used to improve the perfor- mance of cutting tools. Mike Schultz, co-founder of Surface Solutions, says the cathodic-arc PVD coating services his Fridley, Minnesota, company offers can increase the life of a tool as much as 10 times compared to an uncoated tool by providing a harder, more lubricious and wear-resistant surface. In addition, he says PVD coatings are being increasingly used by medical device manufacturers to differentiate the appear- ance of their devices from similar products and/or enhance their devices' performance, being that the hard, inert coatings are biocompatible and don't react with bone, tissue or bodily f luids. 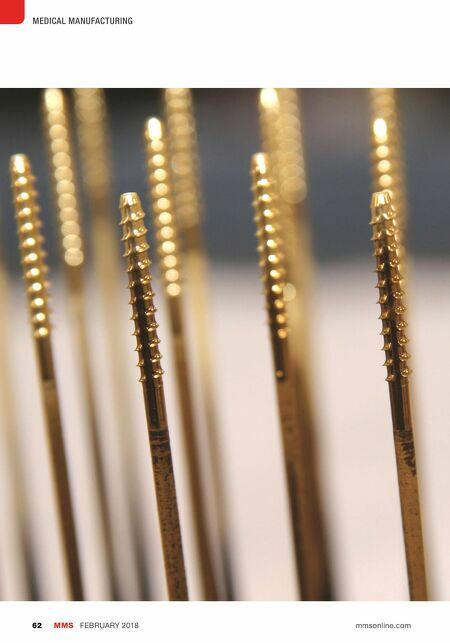 Examples of medical devices the company coats include distractors, drills and needles, but also "wear" parts used in various device assemblies as well as dental applications. Mr. Schultz says PVD coatings offer improved edge reten- tion so coated surgical instruments remain sharp. For other devices, they can reduce galling between mating stainless steel components, and help prevent oxidation and corrosion. Here, he answers a few frequently asked questions about PVD coatings: What is a cathodic-arc PVD process? Cathodic-arc PVD is a process in which various metals are evap- orated from a solid source material inside a vacuum chamber using an arc welder. The metals evaporated, such as titanium, BY DEREK KORN | E XECUTIVE EDITOR Inert, biocompatible PVD coatings can help improve the look and performance of medical devices such as drills, needles and "wear" parts used in various device assemblies.